Welcome to Texas Golf Simulator rental. Our Virtual Golf Simulator & Swing Analyzer System is now being used by Golf & Country Clubs, Teaching Pros, Businesses and Home Golfers around the world to give 99.9% accurate data of your club before, at, and after impact with the ball. 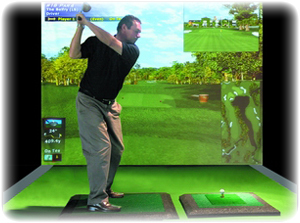 You use real clubs and hit a golf ball in to the large video screen. The ball will then turn in to a video ball object and continue the path towards the hole. Our focus with this system is to simply to provide the most accurate and affordable complete swing analysis and golf simulation system for golfers of all levels. 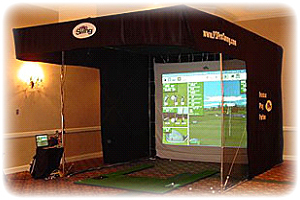 Play Golf - Play golf any time of year at your next event. The system comes with many 18-Hole Championship Golf Courses that allows up to 4 players to compete, just like being on the course. Play alone or have your a couple of guests play this golf game for great entertainment! There are settings for men, women, left/right handed players, tee heights, skill levels, distance tuning, full club selection, stroke/match/scramble play & more! Play game has many options form closest to the hole, puts we can make the game less than 18 holes. WHAT CAN YOU DO WITH THE SYSTEM? Our system includes most Championship Golf Courses that features high resolution 3D graphics and challenges around every corner to please golfers of all levels. You can choose from a Practice Course or a Course Game. After every it of a real golf ball, the golf swing analysis software precisely measures key metrics of your swing, such as swing path, club face angle and club sweet spot and displays them on the computer screen. This analysis is presented in both text and graphical form, which makes understanding your swing dynamics easier. You can even get audio feedback of the results if you like. It is the most accurate golf swing analyzer on the market today.